I remember the first job I landed through an internship program in the finance world on wall street. I needed a complete new business wardrobe consisting of black, navy and blue skirts/slacks, white buttoned down cotton shirts, pantyhose for the skirt suit conference meeting days and the occasional beige suits added in there to break things up - oh, corporate America days! I remember those days fondly. As much as it was a scary thing for me, (as I didn't have parents to coach me about what and what not to expect), thankfully, I'm a hard worker and a quick learner. Also, being loyal and dependable, I quickly got appreciated by not only my bosses, but by my colleagues as well who really took me under their wing. That camaraderie helped me develop confidence in myself and blossom as a young adult in the business world and lead to many promotions within a short period of time. So every time I wear blazers of any sort, especially black, grey or navy blue ones, I immediately flashback to those times in my teenage life in the work force. What's nice about the schoolboy blazer is not only its cut, but its tailored details like the sharp-flattering fit, the gold buttons, and my favorite - the contrast lining of stripes. 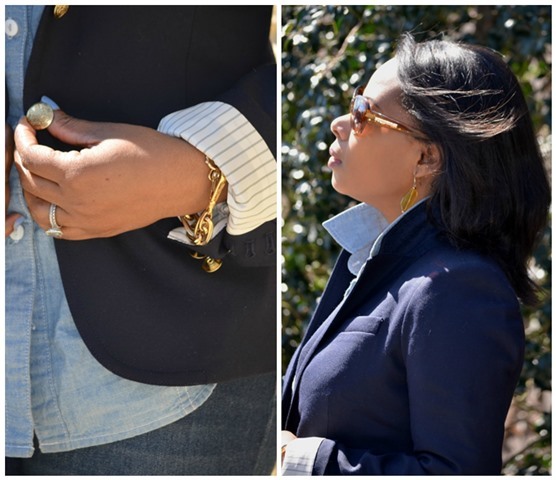 This blazer instantly pulls an outfit together and makes you feel polished and confident. It's an investment piece that every girl needs. 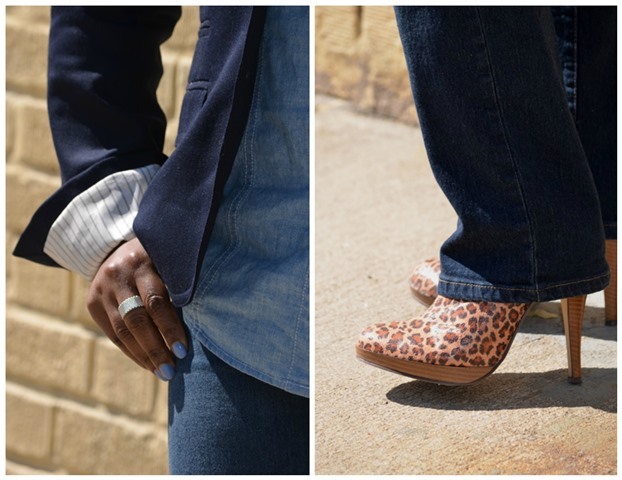 Adding the leopard booties to the all blue outfit is an instant pick me up to an otherwise simple conservative outfit - giving it an element of sass.